Whiting. Hammond. East Chicago. Calumet City. Pullman. Harvey. Dixmoor. Blue Island. Gary. As I slowly become more familiar with the southern reaches of Chicagoland, these names gain more and more resonance for me. Each speaks of strange contrasts, lands of tidy lawns and raw industry, urban decay and pastoral emptiness. It’s a land slightly mythologized by the movie Blues Brothers, whose grungy titular characters rarely ventured north of the Loop. It is a region that has worked hard and sacrificed much over the decades, the city’s blue collar underbelly, the engine that drove Chicago to its industrial peak, only to be abandoned and neglected when US industry began collapsing. 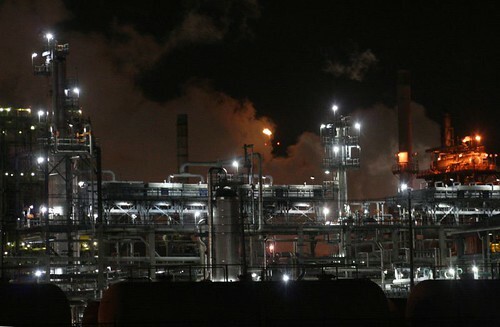 Despite the hard times, a lot of heavy industry remains here. The Port of Chicago operates here, receiving a steady trickle of Great Lakes freighters. 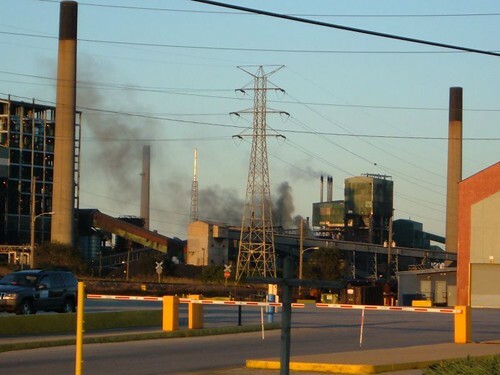 And from Whiting, all the way into Michigan, a line of industrial sites makes Highway 912 one of the most amazing places on the planet. The industrial sprawl once started much further north, within the Chicago city limits, at the site of the US Steel South Works, once the largest steel mill complex on the planet. That facility closed nearly two decades ago, and was leveled to the ground. With the subsequent demolition of the mills and factories along S. Torrence Avenue to the west, large-scale industry has mostly vanished from the Chicago City limits. Despite the decline, even the most cursory overview of the industrial regions is a big undertaking. 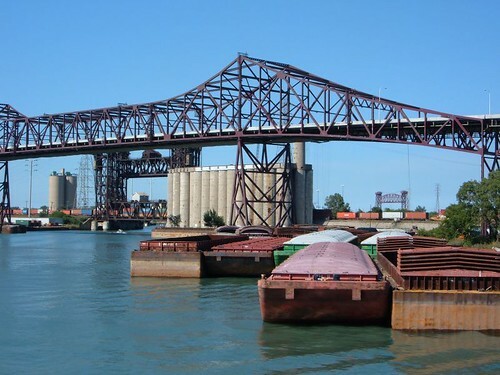 The action today, then, begins at the Chicago Skyway bridges, which soar to incredible heights to cross the Grand Calumet River. Below the skyway bridges, a profusion of industrial sites loads ships and barges, as tugs and speedboats drift past. A trio of movable railroad bridges stands abandoned, their tracks long since torn up, too big and cumbersome to demolish. After the Skyway bridges, one passes the looming State Line Generating Station, which sits just yards away from the Indiana/Illinois border. Rolling on southward, you’ll pass a profusion of casinos, gas stations, medium industrial sites (including the sometimes overpowering smell of Lever soap being manufactured). This land is essentially one continuous urban development, but the “town” of Whiting is one of several here that has its own distinct main street and central business district. 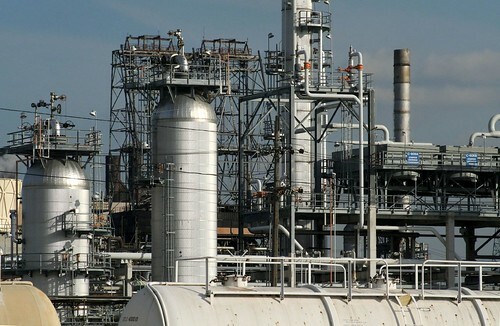 Whiting also abuts an enormous refining complex owned by British Petroleum. 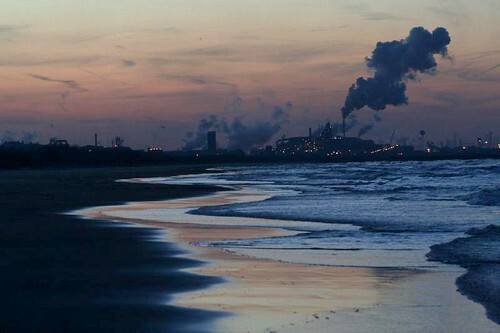 The BP plant sprawls all the way up to the first of the steel mills, the huge facility of Ispat Inland Steel, built on a peninsula made of landfill. Crushed between the two complexes is the tiny planned workers’ village of Marktown, one of the most incredibly isolated residential neighborhoods you’re ever likely to find, and well worth a post of its own. 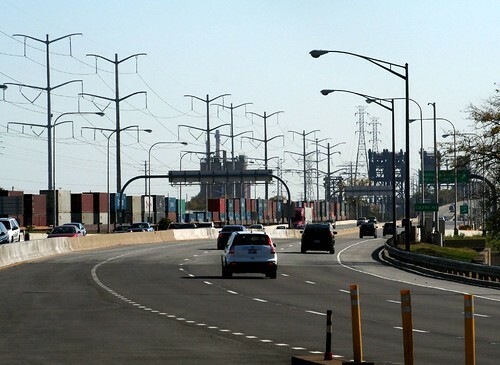 If there’s a center to all this insanity, it’s the Indiana Harbor and Ship Canal, which runs right through the center of the Ispat Inland complex, and is crossed by a dizzying array of bridges and overpasses. Highway 912, aka Cline Avenue, provides an elevated view of the Inland Ispat complex, bringing you nose-to-nose with some of their gargantuan buildings and flying high above their grounds. Cline Avenue turns away from the lake as it continues south, but the industrial sprawl continues. As soon as Ispat Inland’s reign ends, US Steel begins. 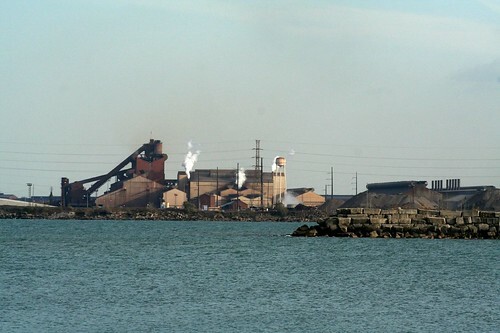 US Steel is the reason Gary exists; they constructed the city as their own company town. Their mini-empire runs for miles along the lake, and consumes the vast majority of Gary’s lakefront. 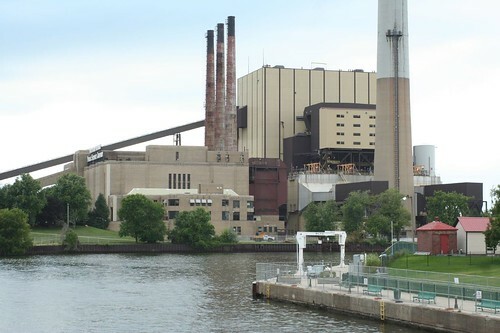 US Steel’s Gary Works is frustratingly inaccessible. Multiple entry points are steadfastly guarded against such wayward rouges as photographers, explorers, and curiosity seekers. Once you finally get past US Steel, the lakeshore of Gary is quite lovely, marking the beginning of the Indiana Dunes lakeshore park. 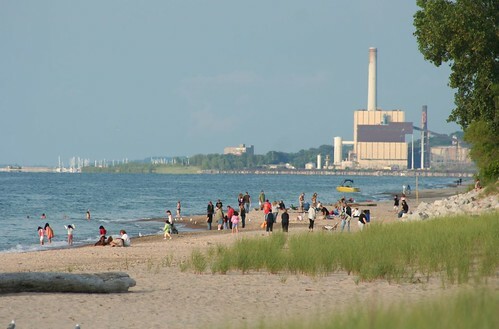 Due to some Machiavellian bargaining back in the 1950s, part of the dunes was carved away to provide room for still more industry, another steel mill (likewise inaccessible) and a power plant at Michigan City that looms over some of the beaches. It can be a shock to look back from east Gary’s waterfront and suddenly realize how far you’ve come from Chicago, whose skyline is 30 miles distant and barely visible across the lake. And it’s a bigger shock to realize the amount of industry you’ve passed along the way. 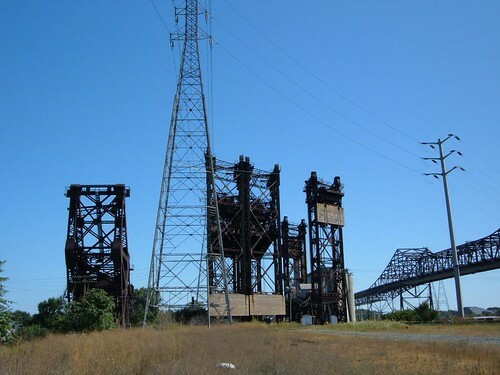 This entry was posted in industry, Northwest Indiana, Rail Bridges, The Infinite City. Bookmark the permalink. Thanks for the honorable presentation you've posted about my home town Hammond. My grandfather built our home there in the 1940's. I graduated in 1974 from G.R. Clark High School in between Hammond and Whiting and spent our weekends from May 1 through September 30 on the nearby beaches of the Indiana Dunes. My mother was a nurse at the medical department of US Steel, my father-in-law worked in what was called Bethlehem Steel — these amazingly enduring neighborhoods are still home to many family and friends there. I am in landlocked Iowa now — the beaches of Lake Michigan are a impossible act to follow! Thanks for the walk down memory lane. Great pics! 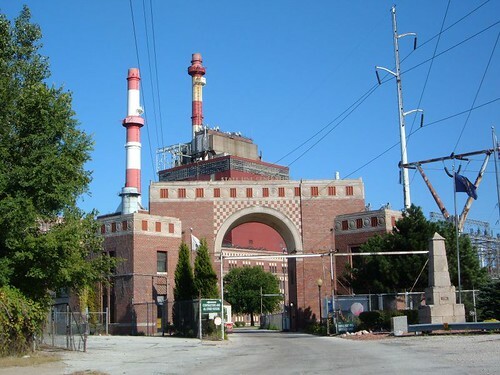 I miss the old Falstaff Brewery right into Chicago – always knew you were in Chicago when it was still there. 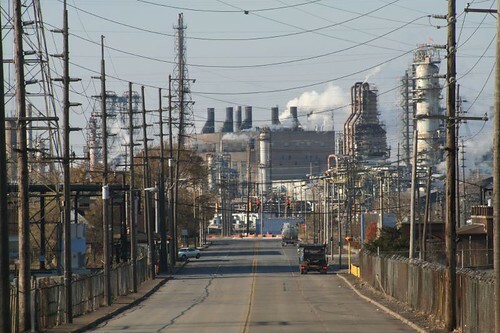 I just drove on Kline Avenue a week ago – it had been years and I'd forgotten how much fun it is to be on a skyway over and above the steel mills there. I need to make a pilgrimage to the model workers community that is nearby as well. I just returned to the Cline Av/Ind. 912 bridge today to take pix of the Inland plant, figuring that with Winter's low humidity there'd be little haze, and Sunday would have little traffic. Had a surprise and saw the bridge was closed. For good! This turned out better for me, as I was able to do the shoot as a pedestrian vs. the expectation to have to be a traffic hazard. Then I get home and see your page. Don't feel quite so original now but will be able to compare my take to yours when the film's developed…. Did the Skyway too plus the state line monument. Great minds must think alike. Too bad I can't readily put my fingers on the slides I got while walking the Skyway years ago, pre 9-11. Can you tell me exactly where Inland Steel is in Gary, IN? View of Cline Ave in September 2010:http://www.facebook.com/photo.php?pid=55908870&l=85e8b2dbf8&id=13751415*WARNING* almost went to jail for this. Hi. I used to live on the corner of 163rd and Price St.,Cal City,ILL.I'm in Kalifornia, but for whatever reasons, I want to come back home after 30 years. I still miss my friends and good ol' girls after all this time. What is it like now and are there "any" kind of jobs for an almost 60 year old guy in good health? Semi skilled tech or industrial. Thanx, help me get out of this freakin' commie pinko, nut job minimum security, bankrupt state! To Nikki – Inland Steel became Ispat Steel which is now Arcelor-Mittal, sometimes just called Mittal Steel. 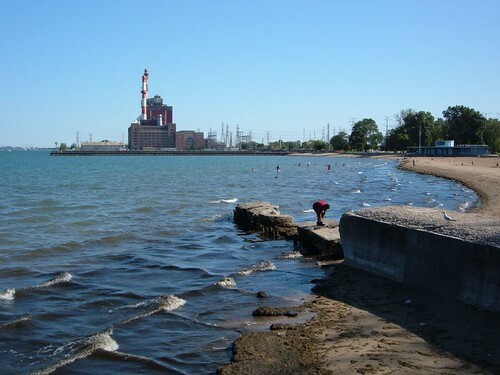 It is not located in Gary, but just west in East Chicago, mostly built on a peninsula created of landfill jutting out into the lake. The peninsula is easily visible on maps and aerial photos.